So you’ve probably already heard of Guru Pet Food, or maybe you haven’t, but it didn’t take long after making Roshe’s Instagram account for me to notice it everywhere on there! So I’d always sort of been curious as to whether it really was as fab as everyone seemed to think. Recently I decided to properly look into Guru, because I was concerned the food we were giving Roshe, just wasn’t that good for him. And boy was I shocked when I saw the rating! I used the site, All About Dog Food, to compare ratings. The food we were giving Roshe came in at a pitiful 0.4 out of 5!! I couldn’t have been more horrified, I felt like such a bad dog mum haha! 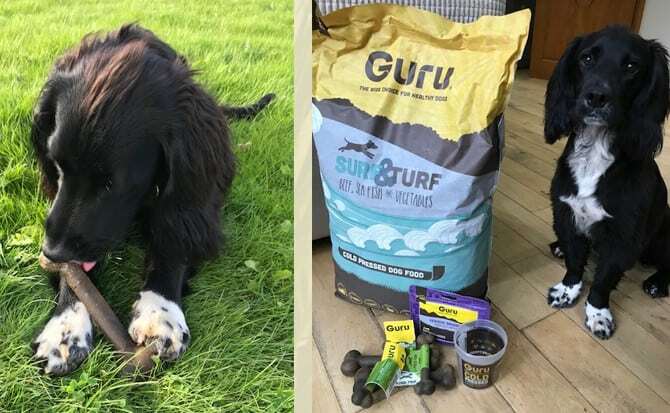 So out of interest I searched for Guru, to find that Guru’s Surf and Turf came in at a fantastic 4.9 and I know this is only one site’s comparisons, but it was enough for me, and you only have to have a quick look at Guru’s website to read all about it and see just how fab it is for your beloved pooch! 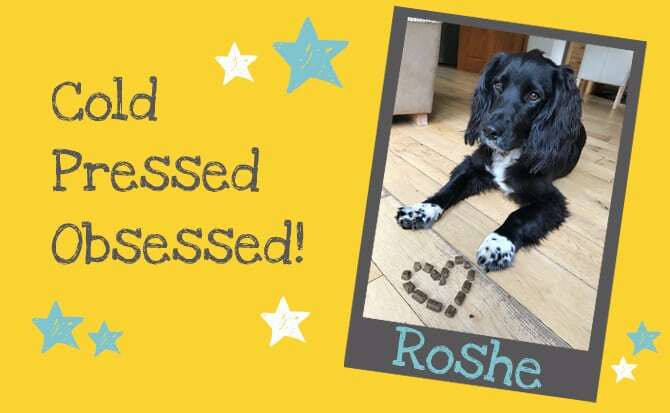 Here is a link with all the information on why becoming cold pressed obsessed could be fab for your pup! 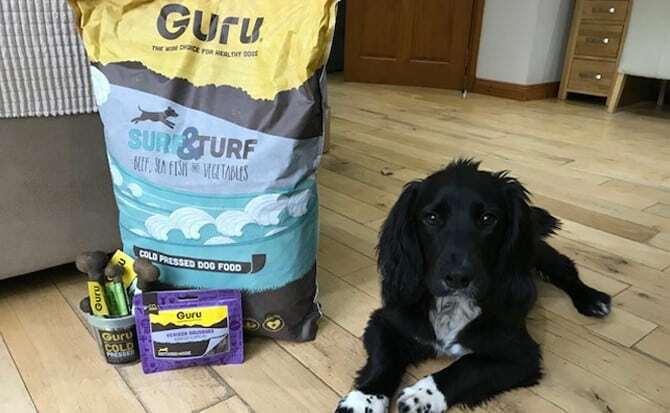 Guru is cold pressed, meaning it holds as much of the nutrients from the ingredients as possible, making it the closest dog food to a dogs natural diet. 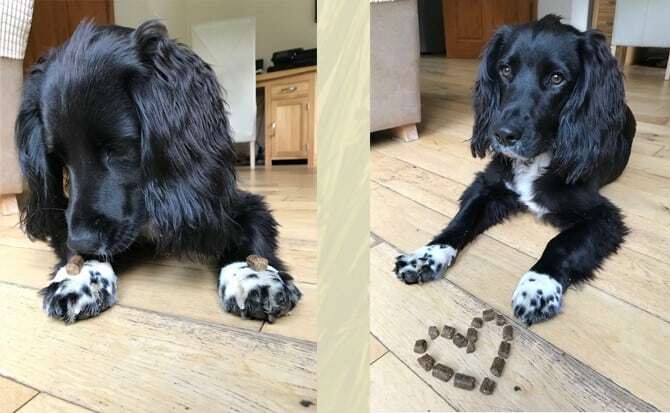 Being a nutritionally dense food, you don’t need to feed your pooch as much as you would a bog standard kibble, meaning you won’t use as much therefore will spend less! Always a plus! There’s no chemical additives or artificial colours, no preservatives, no GM products. It’s a family owned business based in the UK, which has only been going since 2015 and already has such a hype around it, so that can only be a good thing! We first ordered a couple of sample packs for Roshe, one of each of their flavours, Full on Feast and Surf & Turf. At the same time we also ordered a couple of the small field trip bones to see what he thought of them. We do quite a bit of hill walking and thought they’d be perfect for taking with us if he liked them. I quickly realised Roshe not liking them wouldn’t be an issue when our delivery arrived, I could barely get into the box myself before Roshe! He loooved it, I tested a few pieces with him as rewards for a few tricks and he just couldn’t get enough! There was a good amount in the samples, and as we were mixing the Guru with his normal food, it meant we got 8 servings out of both samples. 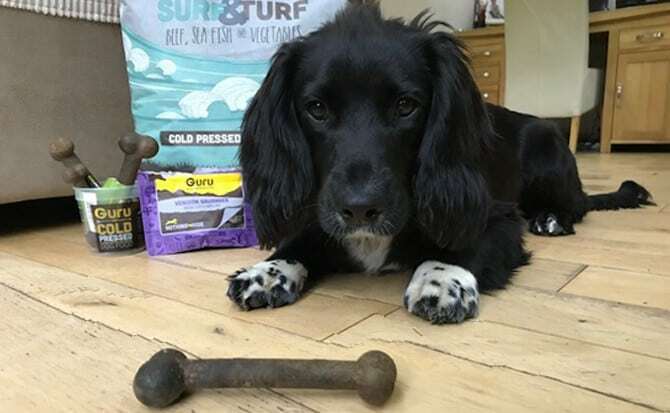 A couple of days later I ordered the Surf and Turf large pack, which is a 14kg bag of food, a measuring cup and a Road Trip Bone. I’d fancied getting the measuring cup anyway for convenience so it was fab seeing this combo on offer, and also getting to save some pennies! Roshe has been on Guru for about a month now and I’m positive it’s already made a difference, his coat is oh so glossy and he doesn’t let off wind like he used to (which is definitely a bonus…) He also used to get smelly breath on occasion and he doesn’t seem to have had that since introducing Guru which is another massive plus! Roshe adored the venison sausages, so they will definitely be included in our next order, along with plenty of Trip Bones! The Trip Bones have come in so so handy, we recently went down to Loch Lomond to stay for a couple of nights and so a Trip Bone was perfect for our journey home over dinner time. They also came in handy as a tasty snack when we reached the top of a munro we climbed recently, they are so easy to take with us. So I would definitely recommend even just the Trip Bones for convenience if you don’t want to make the full on conversion to Guru yet, although Roshe would absolutely recommend that you do I’m sure! Hope this post has been useful to you if, like me, you’ve been considering Guru for a while.